With every year that passes, the current trends in photography change. This is also true for changes within the wedding photography industry. 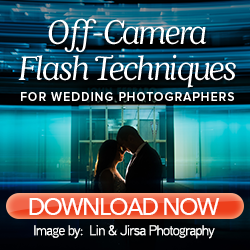 From new photographers emerging to create businesses and competitive marketing strategies to advancements in technology and shooting techniques, running your own wedding photography business can be overwhelming. Creating goals for your business each year can assist you in elevating your standard and get you to exactly where you want to be. When you look back at 2015, did you reach your business goals? Even if you came close to meeting your goals, but did not quite get there, you still spent time working to attract and book your ideal clients. Be sure not to discredit yourself! Booking and shooting for your ideal clients takes up much of your time. After the booking process and post-wedding sales, the engagement and wedding shoots filled up the calendar. Once the wedding day shoot concludes, you worked to finalize their images and additional projects. Whether you shoot part-time or full-time, the process of successfully booking, shooting, and fulfilling post-wedding purchases can be very similar. Here at ShootDotEdit, we love working to help photographers grow in their role as an artist and business owner. We also work closely with many photographers through our wedding photo edits, and we love to learn what current trends in photography occur on a yearly basis. Every year, trends in photography industry change and the standards for what your business should achieve can advance. Because there are so many fascinating statistics we learn, we wanted to share a few of them with you. These are photography trends pulled from our data here at ShootDotEdit, as a part of our photo editing services. Take a look and see what you knew about photography trends 2015 already and what was a surprise. Before you leave, let us know what was your favorite stat! One of the first photography trends we will discuss is the images shot per wedding. 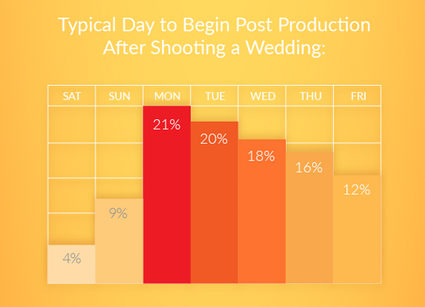 During every wedding, photographers shot an average of 2,945 photos throughout the day. From the bridal prep, to the ceremony, to the events during the reception, photographers made sure to shoot enough photos to capture the moments they anticipated their couples would be excited to see once the wedding day was over. Fun fact: If you were to shoot all of those images on film, you would be shooting with over 80 rolls of film per wedding! Even though photographers shot an average of 2,945 images in total on the wedding day, not all of those were delivered to their couples. After culling the images to remove duplicates, blurry images, and keep only the best of the best, photographers delivered an average of 656 images to their couples. Did you find yourself shooting more weddings in certain months than others? Typically, the winter months are less popular for couples to schedule their weddings, and that is a great time for you to work on your business. As a photography trend 2015, the most popular month to shoot was October, followed by September and August. How many weddings did you have in those months? 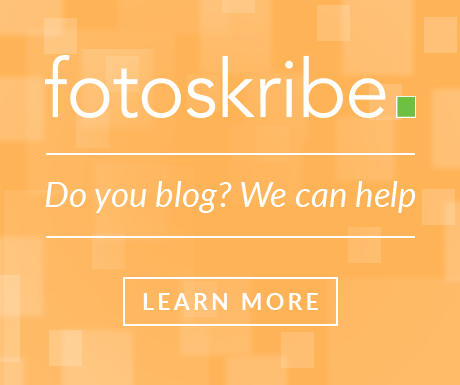 Another photography trend 2015 we will cover is the image post production stats. 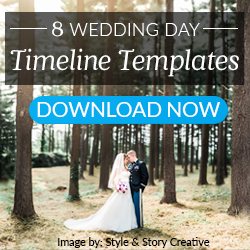 Once the wedding day was over, the post production on your images could begin. From importing the images to your computer, to sending them to ShootDotEdit for Color Correction, the most popular day for photographers to begin this process was the Monday after a wedding. By starting the post production process a day or two after the wedding, it allows photographers to share the images with their couples while they still have the excitement from the wedding day! Regardless if you shot 5 weddings or 25 last year, there were some days that were more popular for brides and grooms to get married on than others. 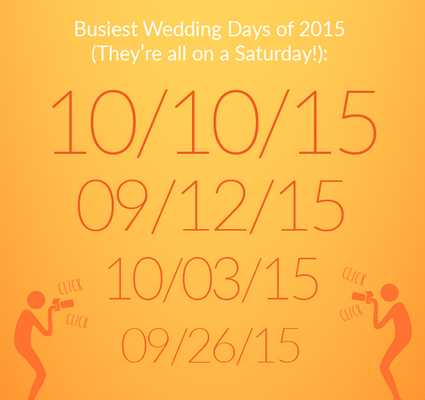 In 2015, the most popular day to get married was October 10, 2015! The next most popular date was September 12, 2015. Take a look at the image to see the top 4 most photographed wedding dates and see how many of these you shot a wedding on! What are your thoughts on these trends in photography industry we put together? How do these photography trends 2015 compare to your own stats? Did you shoot on the most popular wedding day, or do you deliver the average number of images to your clients? Let us know in the comments! To continue your education on all things successfully running a photography business, download our How to Grow Your Wedding Photography Business Guide! 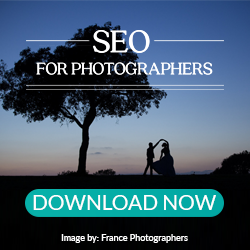 Click the banner below to grab your copy and get started improving aspects of your photography business needed to book more clients and increase your overall profit.